The first thing to address is the controversy regarding packaging in relation to content. 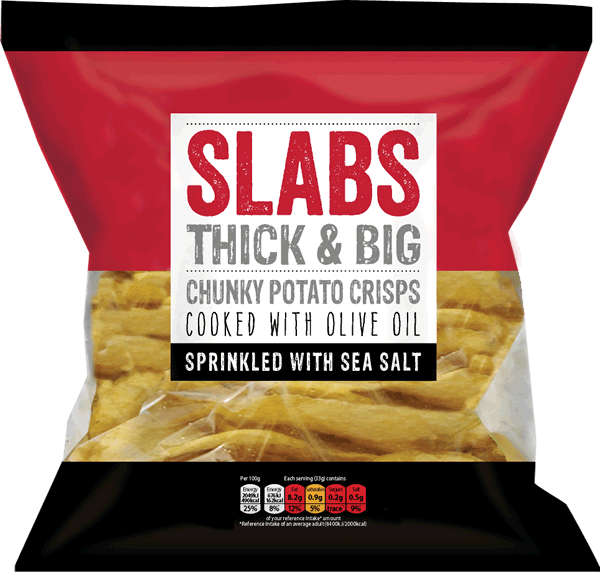 There is no doubt that there are fewer Crisps in the average Slabs bag than others, but there is a very good reason for that: They are thicker and heavier than almost all other Crisps. To some extent, we would agree on the food packaging debate, but not with Crisps. They need and deserve the protection! No-one would be happy if a bag was full of mushed Crisps. This all leads on to the most notable feature of this packaging. The see-through traditional look is perfect for displaying the unique nature of these Crisps, but unfortunately this also leads the exhibition of limited content - We would suggest a smaller window. There is also a further unique offering. The single serving bags have the seals at the side, which is worth a star on its own. And to the more graphic design led aspects - the central description box does it's job very well, with a bold and dominant flavour colour coding that wraps from the top half around the back to the base of the bag. One small critique would be that the flavour should be in the same colour coding rather than a black box. These were thick, hard and solid. They did not Crunch like traditional Crisps, but that was because they were over 2mm thick in parts! They did however degrade in munchiness at a familiar rate. It seems almost unfair to compare these Crisps with any other we have tested. There lack the curls and gnarls of the very best of Handcooked Crisps, but this was because they are so thick and meaty that it would be impossible for them to curl in the bubbling cooking oil! They were flat, hard, oil infused and yellow brownish in colour. It is important to remember that the flavour written on the bag says "Sprinkled with Sea Salt". if rated purely against Sea Slat flavour Crisps these would fall slightly short. However, the flavour description was spot on. They were potatoey and slightly Salty. The only slight criticism would be that for that flavour to work perfectly the potatoes need to be desperately fresh and of the appropriate variety, which is mostly grown in Idaho, USA. Crisps often accompany sandwiches to make a good lunch. I would say these were impressive enough to be the lunch, which you can add a sandwich to if you wish!